Students and teachers from all the schools that participate in the project came to the Gustav-Heinemann-Schule in Mülheim at the end of February. 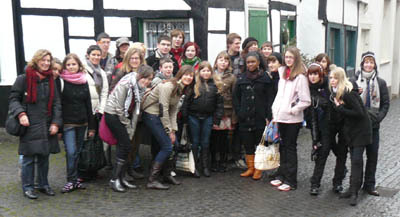 The students stayed with German host families during the four days that the meeting took. At the beginning of the meeting, the guests were welcomed in the hall by the Headmistress and by the students from class 5.4, which had participated in the project. There was also some music on the piano by Alina from 5.3. During the meeting, the students from the various schools presented the results of the work they had done so far, mostly on the topic of festivals. 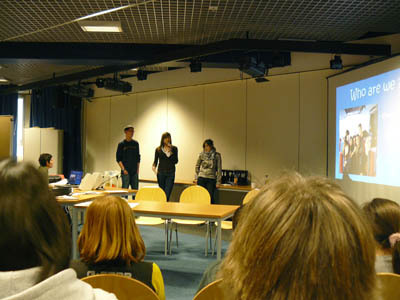 The majority had prepared computer-supported presentations. There was a wide range of talks on various aspects of the festivals in our countries, although Christmas was the annual event that was discussed most often. In another part of the meeting, the students got together in international groups to discuss Hallowe'en, to compare how it was celebrated in their home countries and look at the similarities and differences. The results can be seen on our Hallowe'en page. There was also an opportunity to walk round the city of Mülheim and see the sights in the old town. The afternoons and evenings were spent with the host families.